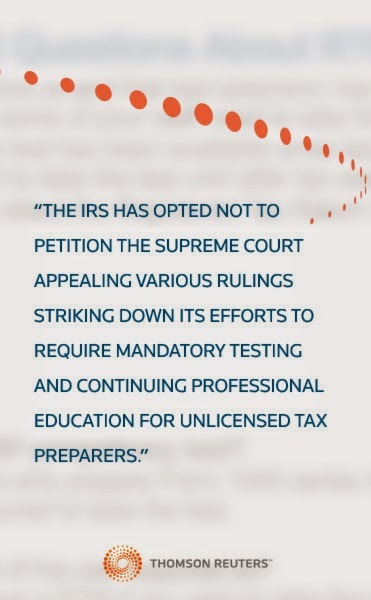 The IRS has opted not to petition the Supreme Court appealing various rulings striking down its efforts to require mandatory testing and continuing professional education for unlicensed tax preparers (Loving vs IRS). There is still a strong sentiment, however, for mandatory testing and continuing education as noted in the hearing describe below. The IRS offered a volunteer form of certification. The Obama Administration’s 2015 budget includes a proposal to explicitly authorize the IRS to regulate all paid tax preparers. Loving vs IRS was successful in preventing the IRS from regulating paid tax preparers by requiring them to pass a competency test and take CPE. National Taxpayer Advocate Nina Olson supports requiring competency exams for tax preparers. Committee Chairman, Ron Wyden- (D-Ore,) touted his state’s tax preparer licensing standards. Chi Chi Wu, a staff attorney for the National Consumer Law Center stated that the NCLC was in favor of the state licensing approach and they have developed a model act that states could use to implement such laws. Dan Alban, Attorney for the Institute for Justice who successfully sued the IRS in the Loving vs. IRS case, disagreed with the need to give the IRS the authority to re-impose the tax preparer licensing requirements. He recommended a voluntary certification program that would allow both consumers and preparers to decide if they value certification. John Barrick, an associate professor of accounting at Brigham Young University and a CPA, testified that return preparer regulation should be allowed if the costs do not outweigh the benefits. The majority of the participants supported some form of mandatory competency testing for unlicensed tax preparers. It is interesting to note that Alban and the IRS both recommended voluntary certification. The majority of participants, however, supported mandatory testing for unlicensed tax preparers. Should all unlicensed paid tax return preparers be required to pass a competency exam and to take CPE, or are there other ways to ensure that preparers are competent to practice? Gerald Celente, author of the 1997 book Trends 2000, predicted that interactive, online leaning would revolutionize education and training. He also predicted that, “in the 21st century, online learning would constitute 50% of all learning, education, and training.” He was right on both accounts. The standard for training accountants has long been in the form of an information transfer with an instructor standing in front of an audience lecturing on a specific topic. However the traditional lecture is not the only way to learn. Learn during their peak learning times. Learn at their own speed. Focus on specific content areas. Studies show that how an individual learns is usually determined by the method of learning they experienced in school and growing up, which to a certain extent, is determined by when they were born and how much access to technology they had. I am part of the Baby Boomer generation, and I learned primarily through lecture, reading, taking notes, and class participation. My learning was not impacted as significantly by technology since I grew up before computers and the Internet were an integral part of everyday life. As you might expect, I prefer live instructor-led training. When online learning is combined with more interactive instructor-led training, it will easily outperform the one-size-fits-all, traditional delivery method. As predicted, the Internet has changed the preferred method of learning from the traditional lecture method to online learning. For course designers, the challenge for meeting professionals’ training needs will be to design programs that can appeal to all the different learning styles and methods of all adult learners.